To make it easy for customers to provide feedback, and to help organisations learn more from their customers, CTMA has developed two powerful and easy-to-access online customer feedback channels. Please contact us to schedule a call to discuss how we can help you measure customer experience and make it easy for your customers to provide feedback. Combined with our other research and consulting services, these voice-of-the-customer solutions provide organisations with systematic and cost-effective feedback from their customers and insights for business improvement. 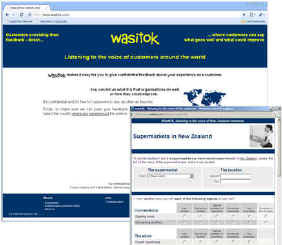 WasItOK is a confidential on-line customer feedback tool that provides customers with access to a series of brief and easy to complete industry-specific feedback questionnaires. Customers can provide their feedback anonymously and data is reported back to our subscribing businesses in aggregate form, together with a compilation of the comments entered in the comment portion of our questionnaires. Specific results for an individual business are only revealed to that individual business, together with an aggregate of results from other participating businesses in that industry - for purposes of performance comparison. Multi-branch reports can be made available to the corporate head office or franchisor, for their review and distribution amongst individual branch managers or franchisees. Tell Simon is a customer feedback channel that provides customers with an easy-to-remember place to go on the Internet to tell companies about their experiences doing business with them and ask the questions they may have. TellSimon makes it very easy for customers to contact the companies they have dealt with. Once a customer has entered their question, suggestion, compliment or concern into TellSimon, it is forwarded directly to the company's nominated email address for their attention. TellSimon follows-up later with customers and we monitor ongoing customer experience with the TellSimon feedback channel and the effectiveness of company responses. Company-specific tracking reports are available to help monitor the effectiveness of their response process in terms of customer satisfaction and loyalty and to help them identify opportunities for improvement. For more information about CTMA's customer feedback, voice of the customer solutions, and how they can help you collect customer feedback about your organisation, please contact us.